�During the nearly period of swimming competition, I will practice very hard and it makes me feel very tired�. 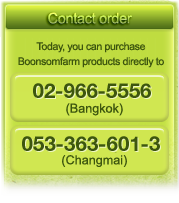 P�O (Chollathorn Voratamrong) has suggested me to have Spirulina GD-1 which he has taken for a long time 30 pills a day. It makes me feel fresh, stronger and my weight importantly decrease from 74 to 67 kilograms; and my body condition has become more ready for the competition. For N�Jan Jan, she had won Jochinyo, the national team atlete of Singapore who had never been loss. So, it has become the greatness of this Thai child.